When it comes to a plasma TV console with the looks and features you’d expect in an entertainment center, one plasma TV stand comes to the head of the pack. The Feature-Full Heritage Plasma TV Stand with Towers. So notice its attractive design. Plus its solid hardwood construction and rich, natural woodgrain. You’ll agree that this TV console would greatly enhance the look and feel of your living room or den. Not to mention making your entertainment more fun! The Amish-crafted Heritage Plasma TV Stand boasts solid wood and customizable storage options. The center part of the Heritage Plasma TV Stand with Towers is 60 inches wide. So you have lots of room for your big-screen TV. Also, below the 1-inch-thick, solid hardwood top, we created cupboard space behind two glass doors. What’s more, you’ll find two adjustable shelves behind each glass door. And they give you space for your DVD player, stereo and other electronic appliances. Open the wood tower doors, and you’ll notice three slide-out media trays on each side. They’re all ready for your CDs and DVDs. What’s more, all four doors come with concealed hinges and a soft-close feature. So gently push an open door, and it closes automatically. In addition, the two drawers open full extension. So you’ll enjoy easy access to everything inside. Even items at the very back of the drawers. The Heritage Plasma TV Stand with Towers is far more sturdy and durable than pieces normally found in traditional big-box stores and franchise furniture stores. This is because skilled Amish artisans custom-craft each TV stand. The Amish men use solid hardwoods like oak, maple and cherry. Plus, they draw from tried-and-proven, traditional woodworking methods. The result? This TV console is incredibly sturdy. In fact, with proper care, it should last long enough to help entertain the next generation – and perhaps more. You can order the unit as shown. Or, you can customize it to meet your desires. For example, you can select the wood specie, hardware and finish. Or, you can get your TV stand built 2 1/4 inches deeper. 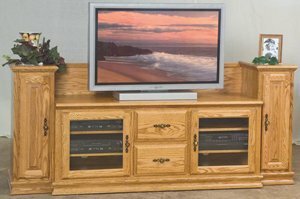 You can explore the Heritage Plasma TV Stand with Towers and other Amish-made plasma TV stands at Weaver Furniture Sales’ online store. Or, check out Weaver Furniture in person by visiting their ‘brick and mortar’ store in Shipshewana, Indiana.